I participated in this campaign in conjunction with the Role Mommy Writers Network and Cottonelle. I received product in order to facilitate this post. However, all opinions are 100 percent my own. "I neeeeeed some potty help!" That's why we have been using Cottonelle products to help my little develop his own Cottonelle Care Routine. I am so happy to have some products that can help him to "clean up" on his own, and actually do a good job of it! I'm not sure if it's his age or what, but I have found that the only thing that works for him is Cottonelle paired with Cottonelle Fresh Care Flushable Cleansing Cloths. His own little Cottonelle Care Routine! Thank goodness. All I can say is IT'S. ABOUT. TIME! I have to say, these On The Go Soft Packs have saved our butts (hahahaa!) on more than one occasion! It is so nice to have something to throw in my purse to help my little out along the way if he should have a problem! Especially with the holidays coming up, we are out and about all the time,and he always seems to need to "go" at the most inopportune times! Now, I'm prepared! Do you have a "Care Routine" at home? If not, you really should! 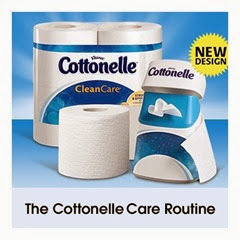 Cottonelle has so many great products, they make it easy to take care of all of those private issues! Documentary filmmaker Cherry Healey (LOVE her!) is facing the awkwardness and talking to folks everywhere about their clean routines! She knows what's up with the Cottonelle Clean Routine and she's not afraid to share it with everyone and make sure that everybody gets the cleanest bum possible! I lover Cherry, she is so cute and so funny too! Have you seen her videos for Cottonelle? Which video is your favorite? I absolutely love the wedding one! So funny! If you haven't checked out Cottonelle's Care Routine products and developed a routine of your own, you are really missing out! Make sure to follow them on Facebook and Twitter so you can be up to date with all of the latest in CLEAN! You might think I'm crazy, but I'm telling you, don't knock it til you try it!